The ‘2001 The Coppermine Road Cabernet Sauvignon’ from d’Arenberg winery in McLaren Vale, South Australia should be the last bottle of wine we drank with a proper meal, sitting on our Indian garden furniture on the back terrace overlooking our lush tropical garden. The next day, all should be packed away. Interestingly, the food was also Indian. After all, we came from India to Indonesia in 1998, ironically everything seemed to revert back. 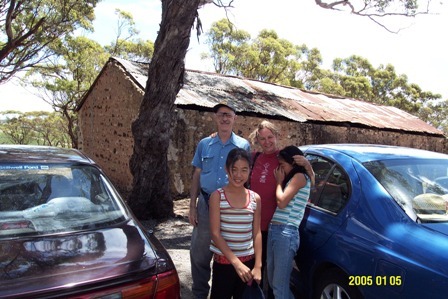 In January 2005 we had visited d’Arenberg winery with our friend Sylvan Elhay from Adelaide. The photo above was taken in the car park. We tasted some wines in the tasting room (of which I have no picture) and enjoyed, apart from the wines, the beautiful valley view, depicted in the photo below. The ‘2001 The Coppermine Road Cabernet Sauvignon’ has a beautiful dark, almost blue/black) red colour (almost like blood). The wine has won many gold medals in various wine shows, for instance the 2003 Pacific Rim International Wine Competition, the Perth Royal Wine Show and the Sydney International Wine Competition. The latter awarded d’Arenberg also the title of “most successful winery” in 2003 and the San Francisco International Wine Competition followed with the “Winery of the Year” award the same year. So “gold” was all over the bottle. It retailed for about US$ 40 in the Fatmawati duty free shop in Jakarta and I had reserved the bottle for a special occasion. The vineyard where the grapes for this wine are grown has a long and interesting history (www.darenberg.com.au). D’Arenberg’s new website design includes an introductory video worth watching. Among others the winemaker, Chester Osborn, fourth generation of the founder family, explains the philosophy of their wine-making style. The Coppermine Road wines belong to the category “icon wines”. 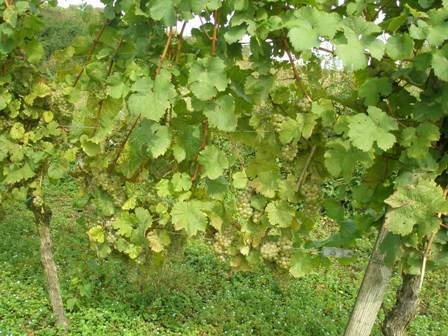 The grapes come from a Cabernet Sauvignon clone which is almost extinct. The wines show an intense flavour of blackcurrant, cassis, some chocolate notes. The wine critic Robert Parker suggest a cellaring of 5 to 7 years. So, the 2001 vintage we drank was just perfect. Ang guess what? According to the website and the label on the bottle, even traditional foot-treading is used prior to modern pressing techniques. Not many wines enjoy such treatment these days. 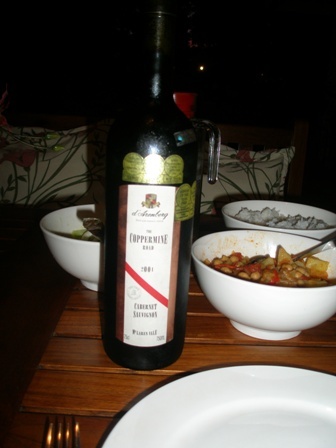 The wine had an excellent balance of oak and tannins and we thoroughly enjoyed it with a meal of “left-over” Indian dishes. It was a wine for a special occasion, and a special occasion it was. Quinta da Lama is not easy to find. If our host of Quinta de Gatão, Mr. Jorge Coelho da Silva, would not have guided us. He drove with his big BMW motorcycle in front of us so that we could find it otherwise we would not have a chance to experience this unique place. Quinta da Lama is located in Vila Meã, near Peñafiel, the centre of Vinho Verde in northern Portugal. The restaurant is domiciled in an old olive oil mill and renovations are still ongoing. The millstone is at the centre of the restaurant and very picturesque. Rural equipment including tools from an old distillery can also be found. The interior is simple country style, extremely charming and very appealing. Rural folk all over the world will recognize its authenticity immediately. One of the three female proprietors is Susana, an energetic young woman who speaks perfect English. The day we visited, she took our orders and served us the food. She made us feel at home. And as at home, we ate splendidly. To say it from the outset: this was quality food; fantastic rural dishes you won’t find elsewhere. It was our last evening in rural Portugal and we had cause to celebrate. Looking back on a wonderful week in the countryside east of Porto. As customary in Portugal, a platter of appetizers is put in front of the diners. It consisted of home produced ham, local cheese, a sausage made from chicken and beef, melon and olives, all very delicious. We devoured the home made sausage made from chicken and beef. We drank the house red with the meal, a solid “Landwein” (table wine) as the German say. Our girls ordered a mixed grill type of dish with potatoes. I had a pork dish with chestnuts. As customary in Portugal rice and potatoes are consumed simultaneously. We had various desserts. I show you two of them, a ‘Crême brulée’ and the “secret” of the house, Papa’s D’Anjo. Papa’s D’Anjo is a local dessert made of eggs and sugar syrup as far as I can recollect. It is very intense and one needs a lot of stomach space left to leave the plate behind empty. But what a delight this dish is. The fruit flavours are just incredible. The end of the meal was celebrated with a “digestivo” which was equally a local invention. It’s the “trademark” of Quinta da Lama and is called Xiripiti, consisting of brandy home-distilled, with honey and cinnamon. There is only one thing I can say, come to rural Portugal and visit Quinta da Lama in Vila Meã near Peñafiel just about an hour east of Porto in the Minho Region. 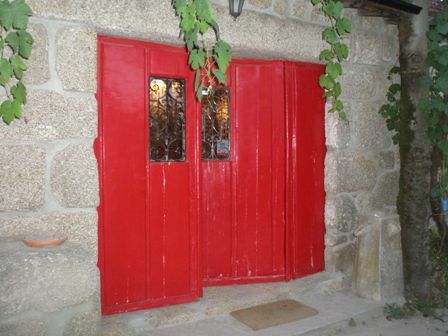 I will let you know more about rural Portugal soon. There are so many wonderful things we saw and experiences we were able to make. The hospitality of the people is just unbelievable, especially at Quinta da Lama. The last days in any one place, one is inclined to romanticize things. But never forget “one man’s joy is another man’s torment”. 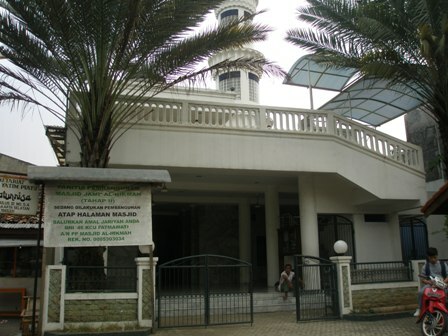 It seems that the Chatib (in some places one calls them muezzins, the ones who call the faith to prayers) of the little mosque nearby is not calling for night and morning prayers as he used to. Maybe someone made a generous donation to the mosque to shut them up. We did not sleep much the last couple of days in our little paradise in Lebak Bulus IV, No.9 C. In the past we used to struggle against the sound of the Chatib keeping us awake. Nonetheless, we long for the farewell signals of the call to prayer as we lie awake wondering about the life to come. The last Sunday lunch in our Jakarta home was a ripper of a lunch. The lamb stew (Australian lamb) with green beans and the mushed potatoes (Bandung potatoes are stunning for mashing) were such a delight. My taste buds were exploding. This is ‘orgasmic food’ at its best, I might add. The recipe came from Marcella Hazan’s “Classical Italian Cooking Book” of course. This time I was right with the choice of wine. The last bottle of ‘2004 Two Hills Merlot’ went. The ‘2004 Two Hills Merlot’ also displays ripe wild berry fruit but not the liquorice and nuts flavours. The wine is very subtle, elegant with great finesse. It is medium bodied, dry, with good acidity, and a long finish. Its tannins are firm and give the wine a fine balance. The wine was just a perfect match for the meat stew. We could not have spend our last Sunday in our Jakarta home in a better way. Farewell, so long, auf Wiedersehen, good bye! PS: The good news is that we have a reasonable supply of ‘2006 Two Hills Merlot’ which we are going to release in fall 2008. Friedel Engisch (in Wuerzburg) and Gert Kueck (in Leipzig) are the only ones in possession of some bottles of our 2004 Merlot. Lucky you. Because of our move to Bangkok, Friday was a busy day. Packers everywhere, the house is like a nest of wasps, it seemed. Not easy under such conditions to find some peace of mind, but I did. Another year had gone bye. My daughters had woken me early in the morning to wish me happy birthday. More well-wishers would come to join them over the day. My birthday dinner consisted of a ‘Risotto ai Funghi Porcini’, hm, that was beautiful as we say in Australia. I have loved risotto ever since we lived in Rome, Italy. And ‘funghi porcini’ is just the best “profumo” you can imagine. What a wonderful ruby red colour the Shiraz from Hanging Rock has. a ‘2004 Hanging Rock Cambrian Rise Shiraz’ from Heathcote. 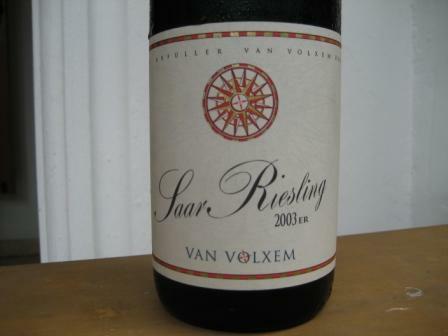 a ‘2003 Saar Riesling’ from Van Volxem Estate in Wiltingen, Saar. I chose the ‘2004 Hanging Rock Shiraz’. The bottle was given to me by Andrew at the cellar door when we went on a wine tasting in August last year. If you visit the region of the Macedon Ranges in Victoria, you have to see this vineyard and taste its award-winning wines (see also my blog entry from 09. September 2007). 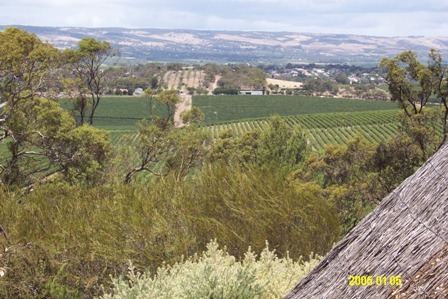 Hanging Rock has also a vineyard in the Heathcote wine region, Central Victoria where its award-winning Shiraz wines are grown which enjoy an enormous demand from consumers in China. The Hanging Rock winery in the Macedon Ranges. In the back you can see the rock. 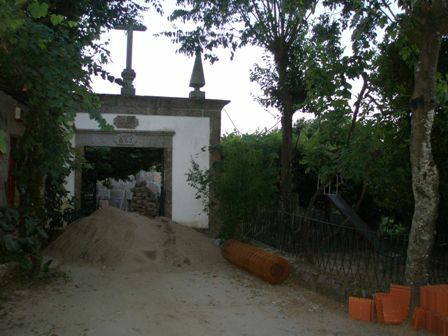 The photo was taken in August 2007. 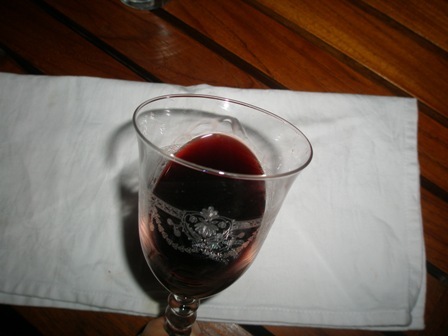 The wine is a blend from several vineyards near the Mt. Carmel range. It is beautiful, has a ruby red colour, and very intense plum and cherry aromas; it is very fruity, has immense depth, a good structure and actually everything you want from a Shiraz from the Heathcote wine region with its hot summers. The Cambrian soils of the Heathcote region are the key to the fame of its Shiraz wines. Isn’t the ruby red colour of the Shiraz of Hanging Rock wonderful? Pity the wine did not match the food (my mistake). The ‘funghi porcini’ were too delicate and subtle and the wine just overpowered the fragrance of the earthy mushrooms. We did not care this time, enjoyed the tropical garden view and the sweet heat of a dry-season evening. One last time. I wonder where I will celebrate my next birthday. Over these thoughts I blew the smoke of a Partagas cigar which was given to me by my friends Liz and Walter in Jakarta. Delicious! On a recent flight from Bangkok to Jakarta, I flicked through the airline magazine and found an interesting article about Thai wines. Yes, also the Thais grow grapes these days. At Baan Khork Chang you can find the HuaHin vineyard (www.huahinhillsvineyard.com), near the seaside resort of Hua Hin. As a unique feature they offer elephant rides in the vineyard. Who can beat this? The estate, though called a “boutique” vineyard, is not quite small but covering 400 acres (what would they call our 4 ha vineyard if 400 acres warrants the label “boutique”). The article says that the vineyard was planted on the site of a former elephant corral. Another feature difficult to beat. A photo collage from the magazine of Thai Airlines (see above) gives a glimpse of the adventure waiting for the casual visitor. Why the guy on the elephant’s back is holding a hoe is not clear but he must be up to something. When we finally live in Bangkok, I will check this vineyard out and sample some of its wines. According to the website, Hua Hin grows Tempranillo, Brunello/Sangiaovese, Shiraz, Black Muscat, Chenin Blanc, and Colombard. The wines must be quite good because the Hua Hin Vineyard has been awarded four international wine medals. I will definitely see what this is all about. Who of you has tasted the wines as yet? You are currently browsing the The Man from Mosel River blog archives for August, 2008.